Self-rated general health has been used widely in health surveys as a single-item measurement of health-rated quality of life. Heterogeneity in self-evaluation of health has been well documented, yet the causes of this heterogeneity are poorly understood. 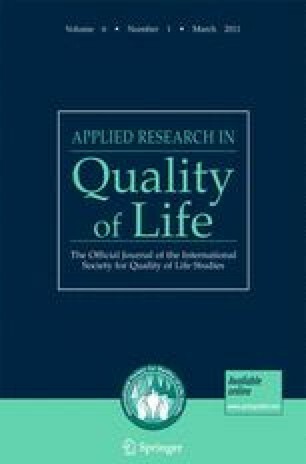 This study evaluated the moderating effects of age, aging, gender, race, education and income on the relationship between physical functioning and self-rated general health using social comparison theory as a guiding framework. A longitudinal mixed-effects regression model was used to analyze a cohort enrolled into the Health and Retirement Study in 1993 that was interviewed at baseline and during four subsequent waves. The results revealed that the association between physical functioning and self-rated general health is weaker among subgroups that tend to have lower health status; i.e., older individuals, non-Caucasians and less educated individuals. These findings suggest the usefulness of social comparison theory in explaining self-rated general health and provide the basis for future research. Earlier versions of this article were presented at the 59th Annual Scientific Meeting of the Gerontological Society of America (GSA), Dallas, TX, November 2006. The research reported here was supported by the National Institute on Aging (R01 AG021648). RAND Center for the Study of Aging. (2008). The RAND HRS Data (Version H). RAND Corporation. http://hrsonline.isr.umich.edu/meta/rand/randhrsh/rnd_edd.pdf. Accessed 5 October, 2008. Wallace, R. B., Herzog, A. R., Ofstedal, M. B., Steffick, D., Fonda, S. J., Langa, K. M., et al. (2002). Documentation of cognitive functioning measures in the Health and Retirement Study. http://hrsonline.isr.umich.edu/docs/userg/dr-006.pdf). Accessed 26 August, 2004.